The dive site Sandy Cove is a shallow sand bottomed sheltered cove surrounded by rocky reef in the north Oudekraal area on the Cape Peninsula, near Cape Town in the Western Cape province of South Africa. On the north side of the point at north Oudekraal. Sandy Cove seen from the side of the road from the Camp’s Bay side, looking towards the west. The cove is in the middle of the photo and is obviously well protected from the south west swell. 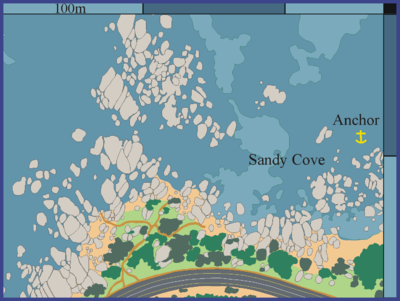 The site name "Sandy Cove" is a simple description of the site. It is a small sand bottomed cove protected by large boulders on the seaward sides. The bottom is generally shallow, with a maximum depth of about 4m on the sand. The cove is almost surrounded by large number of granite corestones of various sizes, and has a flat sand bottom. The surrounding rocks provide protection from the seas and as the site is close inshore, it does not get the worst of the south easter. There are several small caves and swimthroughs under the group of large rocks directly opposite the sandy gully. Often good during or after south easterly winds. The cove is exposed to north westerly swells, which could produce poor visibility and uncomfortable or hazardous conditions. The site is usually at it's best in summer but there are also occasional opportunities during autumn and early winter. None. Security is no better than other roadside parking areas in the area. The south east entry point at Sandy Cove at low tide. Sandy cove from near the parking area. In the background are the rocks of Geldkis and Strawberry Rocks. In the foreground is the entry gully. This site is a shore dive. Park at the side of the road on the outside of the bend on the north side of the Twelve Apostles Hotel. The path starts near the signpost and after a steep descent curves round to the north between some trees and a granite boulder. It continues north-eastwards and then splits in several directions. The first branch is to the left to the entry for Justin’s Caves, The second continues more or less straight down a slope to a shallow gully between big boulders. There is an old piece of rail and small boulders in this north west entry point for Sandy Cove and the other North Oudekraal dives. The third branch is to the right, uphill slightly and through between some bushes, then down over the rocks to a shallow sandy gully, with a small beach at low tide. This south-east (closer to the road) entry point has a sand bottom with large granite boulders on both sides. The boulder on the right is convenient resting place for fins, camera etc when making final preparations for entry. The access at both these points is very protected and safe in almost any conditions you might consider diving. Most of the marine life seen in this cove is on the rocks around it and in the rocky areas to the west. Shoals of small fish occasionally enter the cove, but are usually very shy. The small caves and swimthroughs under the rocks opposite the sandy gully shelter a colourful and fairly diverse range of invertebrates, and the rocks outside the lagoon area are covered by a profusion of red and brown seaweeds, with a few greens. Not recommended as a photographic destination, but who knows, you may be lucky. No particular routes recommended. There is usually more to see around the rocks than on the sand, but there may be occasional shoals of small fish over the sand. The site is very popular as an entry level training venue because it is so well protected, and getting lost takes some effort. It is suitable for checkout dives and would be considered confined water for training purposes by some agencies. It is also a suitable site for snorkelling and night dives. No special equipment recommended, but a good site to test new equipment. This page was last edited on 16 October 2013, at 19:31.